Have you ever tried to do a spell or practice positive affirmations or some other Law Of Attraction technique with maximum sincerity only to find that it didn't work? Like not at all? Does MAGiCK ever work on it's own, without any physical effort made on our part to help it along? In fact, I KNOW it does- at least sometimes- because it's worked for me on numerous occasions, and it's hard to argue with evidence like that. However- I do not think this is the norm. I had the honor of interviewing the delightfully witchy Suzanne Palmieri (author of The Witch Of Little Italy and The Witch Of Belladonna Bay) last year, and she shared with me this idea of a Layaway Plan when it comes to creating "the kickass life of your dreams". There is no wishing. There is no hoping. There is only having. She sets her sights on what she intends to create, declares to The Universe- "that is mine(! )", and then proceeds to make a series of payments, so to speak, over time- until she's brought it fully into being. 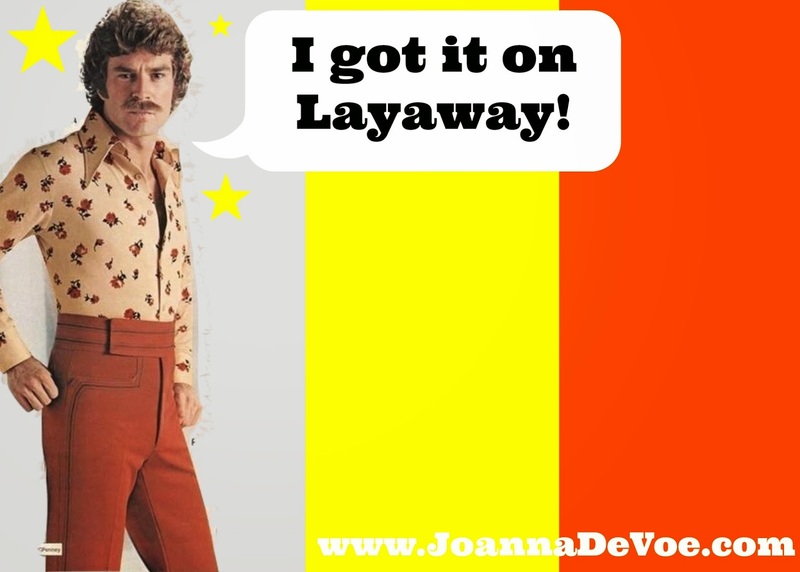 Back in the day, "putting it on layaway" meant that you could claim something that you wanted but couldn't pay for in full, and the store would save it for you until you finished paying for it and were eventually able to take it home. It was YOURS in intent, and the store was just holding it for you until you could make it yours in a more material way. What a cool metaphor that is for MAGiCK. It has an energy to it that screams YES! So- what is it that you are ready to claim for yourself today? Can you claim it? Will you claim it? Oh go ahead... Put it on layaway & then start making those payments stat, one right after the other until you are able to bring that baby home! And- if you'd like some help with that, if you'd like to learn more about creating "the kickass life of your dreams" using MAGiCK and a whole toolbox of awesome psycho-spiritual tools, I'd LOVE to have you JOiN US for this next module of The Psycho-Spiritual Wheel Of The Year. 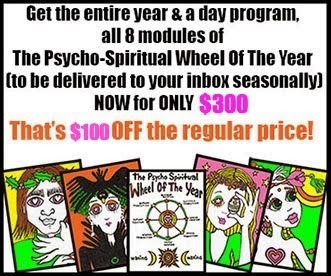 "I would highly recommend the Psycho Spiritual Wheel of the Year program to any and all Pagans, Wiccans, Witches, New Agers, Old Agers, and everybody in between. If you are interested in your own psychological health and well-being, then this program is for you! If you are interested in how your mind works in connection with seasonal changes, this program is for you. If you are interested in having fun, getting support, and meeting cool people, THIS PROGRAM IS FOR YOU! This program takes you through a complete year of looking at yourself and your life and pulls out all sorts of interesting revelations about yourself. Her tips, tricks, and writing prompts will bring about strong, positive changes in your life. Her crafts and potions are easy, fun, and affordable. They are the perfect way to manifest on the outside all of the wonderful new things going on in the inside. Joanna Devoe is very well-read, well-researched, and well put-together. The information she gives to you from her own studies and experiences are well worth the money. "Participating in the Psycho-Spiritual Wheel of the Year has been a rewarding, uplifting, thought-provoking, and life altering experience for me. Each module contains a ton of excellent information and suggestions, And I am loving the crafty project and recipe that are part of each module. In her unique brand of smarts, spirituality, and down-to-earth sense of humor, Joanna has created a one-of-a-kind program that truly enriches the mind, body, and soul. What a perfect way to follow the wheel for a year and a day!" -Kathy S.
This program has already changed my life for the better and I just started! Whether you're Witchy, pagan, or just looking for a different perspective, this is the place! Worth so much more than the dollar amount. I have found a community full of like minded people, but even more importantly, they are all awesome and positive and we lift each other up! I love it and am so grateful that I ran across Joanna one day randomly looking through blogs. The universe really knows just what you need. Hee hee I use layaway in stores! Nuhuh! They still have layaway? Where?! That is awesome.